The Creek Dippers – Golden State Locket. 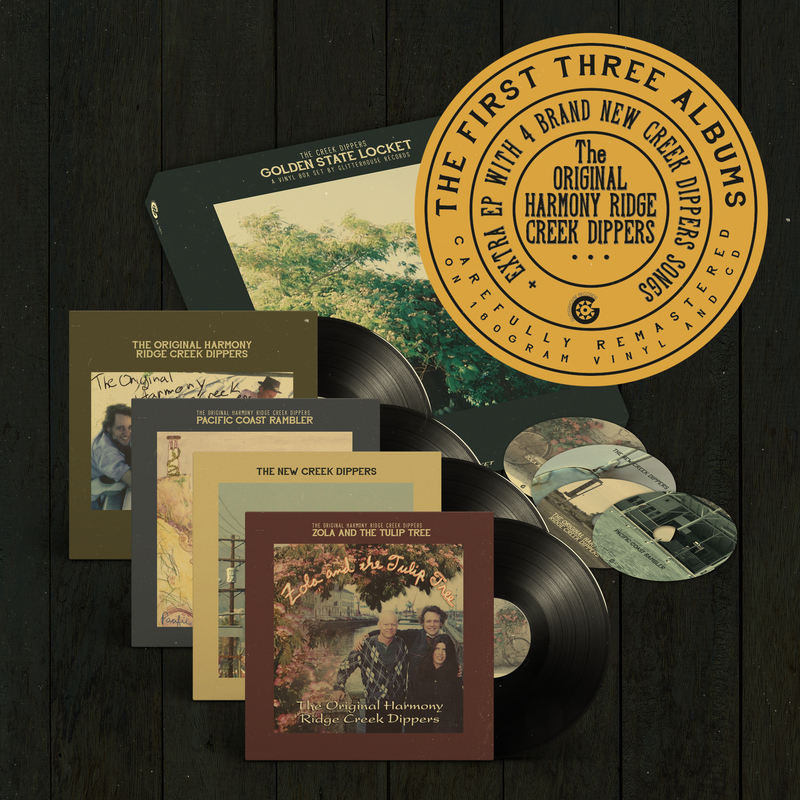 4-LP Box set (180gr., plus cds) containing the first three albums of Mark Olson’s Original Harmony Ridge Creek Dippers. For the first time ever on vinyl. Containing an EP with 4 new and never before released songs by The New Creek Dippers* and an extensive booklet. Carefully remastered for your listening pleasure. Release date: 14/12/2018. Strictly limited to 500 copies! 2 years after he left alternative country pioneers The Jayhawks, Mark Olson and singer-songwriter Victoria Williams alongside Mike Russell formed The Original Harmony Ridge Creek Dippers and released their stunning self-titled debut album in 1997. "The Creek Dippers create a perfect summer day that in your dreams would stretch on forever" No Depression magazine praised the bands' first born. "Olson's songs commemorate such common, everyday pleasures as a good rain and changing seasons" All Music Guide wrote about the 2nd album entitled Pacific Coast Rambler that was followed by the amazing Zola & The Tulip Tree in 1999! All recorded in Joshua Tree, California. Glitterhouse Records is more than happy to release the exclusive The Creek Dippers 'Golden State Locket' 4-LP Box on December 14th!